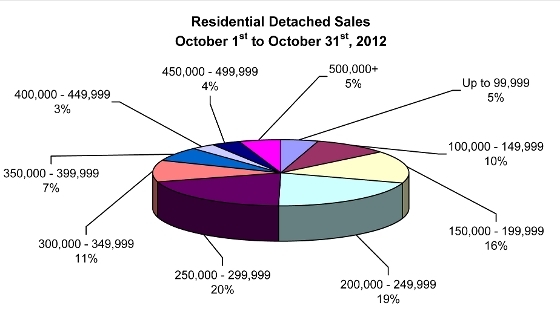 So buyers should be encouraged and also take some consolation knowing October had a two to one ratio of residential-detached sales going for below list price rather than for above list price. The same can be said for condominiums but to an even greater extent with 53% of October sales going for below list price and 21 per cent achieving above list price status. The remaining listings were sold at list price. While a distant third with only 5% of total market share, vacant land has been a real standout MLS® property type this year with a 25 % increase in sales activity and a 48% increase in dollar volume. This result is indicative of the excellent year Manitoba home builders are having with starts well in excess of initial forecast expectations. October MLS® unit sales increased 4% (1,118/1,076) while dollar volume went up 10% ($281.8 million/$256.9 million) in comparison to the same month last year. Year-to-date MLS® sales are up less than 1% (11,554/11,486) while dollar volume has increased 6% ($2.83 billion/$2.67 billion) in comparison to the same period a year ago. 17,000 listings have been entered on theMLS® up to the end of October, a nearly 2% improvement over 2011 and higher than previous years. October 2012 points out once again why there is always emphasis from WinnipegREALTORS® to call a REALTOR®, a local market expert, to help you understand what is going on with respect to your property. Even within the same property type class, the difference in prices can be extreme. The highest-priced home sale was $1,500,000 whereas the lowest only $17,000. The difference in price is a multiple of 88 times. “It behooves anyone dealing in such a dynamic and diverse market as Winnipeg’s, be it urban or rural, to enlist a knowledgeable professional before attempting to buy or sell a property.” said Przybyl. The most active price ranges for residential-detached sales in October were a toss-up between the $200,000 to $249,999 and $250,000 to $299,999. Together they made up nearly 40% of total sales. Behind them at 16% of sales was the $150,000 to $199,999 price range. This same price range comprised 32% of total condominium sales. The average days on market for residential-detached sales was 28 days, 1 day off the pace set last month and 1 day quicker than October 2011. The average days on the market to sell a condominium was 32 days, 1 day off last month and six days slower than October 2011. Interestingly enough, if you remove the $925,000 sale which was on the market for nearly a year, the average days on market for condominiums this October would be the same as last October at 26 days. Established in 1903, WinnipegREALTORS® is a professional association representing over 1,700 real estate brokers, salespeople, appraisers, and financial members active in the Greater Winnipeg Area real estate market. Its REALTOR® members adhere to a strict code of ethics and share a state-of-the-art Multiple Listing Service® (MLS®) designed exclusively for REALTORS®. WinnipegREALTORS® serves its members by promoting the benefits of an organized real estate profession. REALTOR®, MLS® and Multiple Listing Service® are trademarks owned and controlled by The Canadian Real Estate Association and are used under licence.